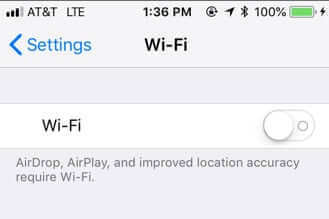 Ever since the update to iOS 11, people have been stymied as to why, after they turn off bluetooth or wifi, it magically (and annoyingly) turns itself back on. You know you turned it off… you checked to make sure that it was off after you turned it off… only to find your bluetooth, or wifi, or both, turned back on hours later! Here’s why, and how to turn it off until you actually want it on. 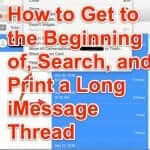 First, if this is happening to you it is likely that what you are doing is swiping up from the bottom of the screen to display the control center, and disabling wifi or bluetooth from there. Correction: And attempting to disable wifi or bluetooth from there. And this is the crux of the issue. 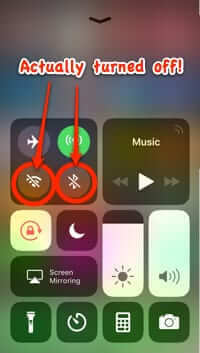 Here’s the thing: starting with iOS 11, “turning off” bluetooth or wifi from the control center doesn’t actually turn them off. It simply disrupts any connections that your phone had with either, for 24 hours. 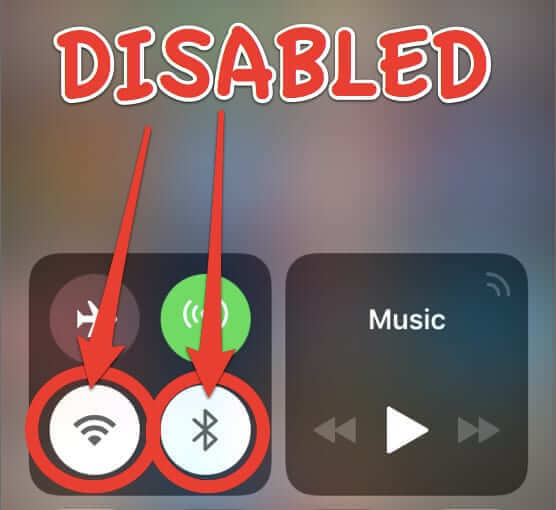 So it disables the connection to the devices (in the case of bluetooth) or to the current router (in the case of wifi), but it does not turn wifi or bluetooth off! 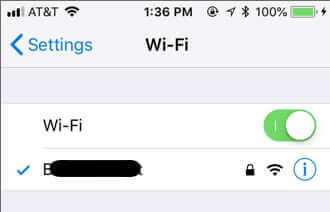 To actually turn either off, you have to do it through Settings. Let’s quickly review how you do that. 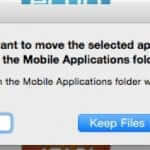 Go to your iPhone’s (or iPad’s) Settings. To turn off bluetooth, tap on ‘Bluetooth’, and move the slider switch to the left by tapping on it, which will turn it off. 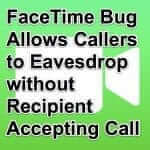 It works the same way for wifi. 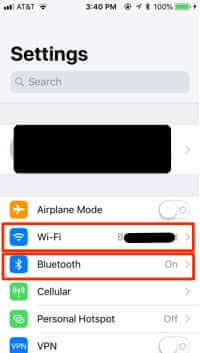 Now, when we say above that bluetooth is off, or wifi is off, we mean that turning them off through Settings actually turns them off, instead of just disabling them. And the icons in control center show that they are genuinely off by sort of greying them out and putting a little diagonal line through the icon. If they are just enabled, the icons are white. 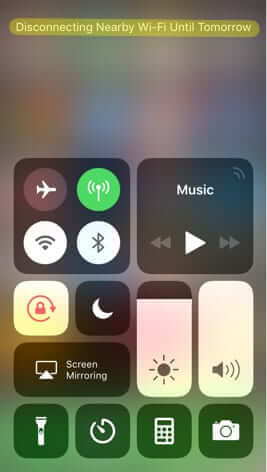 Now let’s go back and look at what those icons look like when you thought you had turned them off through the control center. But wait there’s more! (You knew there would be, didn’t you?) But in this case it’s a good ‘more’! 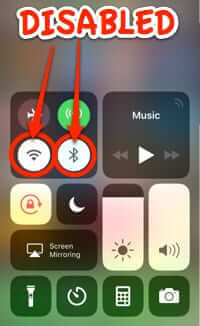 After you turn either bluetooth or wifi off in Settings, you can actually turn them back on by tapping their respective icons in the control center! So, that’s something, at least. 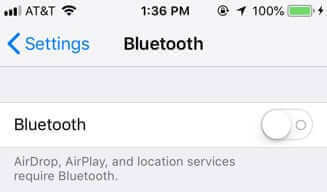 Ever since the update to iOS 11, people have been stymied as to why, after they turn off bluetooth or wifi, it magically (and annoyingly) turns itself back on. 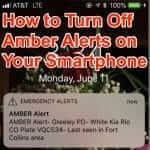 You know you turned it off... you checked to make sure that it was off after you turned it off, only to find your bluetooth, or wifi, or both turned back on hours later! 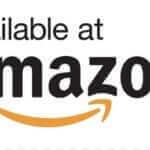 Here's why, and how to turn it off until you actually want it on.